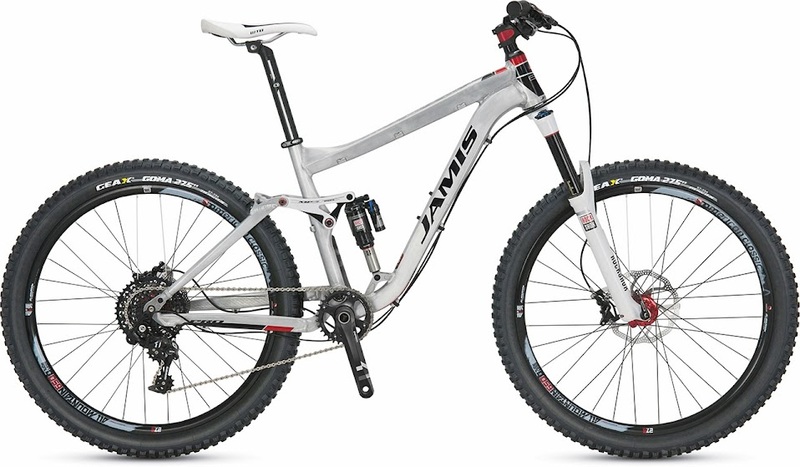 The Jamis Dakar AMT Pro is an all new model for Jamis this year. Its much like the well-established XCT, except it has more travel (6"), and its been beefed up to go faster and take bigger hits, with a little bit slacker geometry, 67.5-deg head tube angle, as opposed to 69-deg on the XCT. Our sales rep, Doug Krauze of Jamis Bikes, is featured shredding the new AMT in this really cool video. See what this new 650b dualie can do in the capable hands of our sales rep Doug, then just imagine what YOU could do on 650b wheels with 6" of plush, responsive travel on 650b hoops. Ride over roots and rocks and even small automobiles smoothly and easily. You'll see Doug riding some pretty gnarly terrain without much difficulty; the AMT seems to float over everything that's put in front of it. We actually did a little review of this bike ourselves. Check it out by clicking on the link below, but not before you watch the YouTube video!